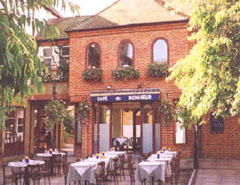 Relaxed, traditional French brasserie serving good quality regional cuisine in a friendly environment. Only the finest ingredients used. Secluded outside terrace for al fresco dining. “Bon rapport qualité – prix”. Regional French cuisine served in this brasserie style restaurant.